It is 60 years since the intervention of the Russian Army snuffed out the brief beacon of the Hungarian Revolution in ashes, blood and dungeons. The magnitude of the events forbids the thoughtless categorisation of the Hungarian Revolution in terms of defeat or victory. The reasons why this workers’ uprising was so devastatingly defeated so that, within a short time, the peace of the grave had set in and why self-empowerment (via the creation of workers’ councils – CWO) did not lead to the ability of revolutionary organisations to appear, lie rooted in the hopes and dreams of those that made the uprising. And these hopes and dreams are still difficult to decode, as they have lain buried under the ballast of a successful ideological idealisation for decades. A glance backwards has to identify the false illusions and deluded hopes of the time, so we are able to understand which mistakes are to be avoided in the future. Terror was used to destroy hopes for freedom and an autonomous socialism in the shortest possible time. The balance sheet starts with 3 000 deaths, including 700 Soviet soldiers, 13 000 wounded and completely destroyed streets, mainly in Budapest. After the suppression of the countrywide uprising and the smashing of workers’ councils which had been in existence for months, well over 350 people were executed by special courts. Summary courts handed out 22 000 verdicts, and 20 000 were interned in Hungarian and Russian camps. More than 200 000 refugees streamed out of the country. In this way, the Hungarian Revolution burned itself into the pages of the history of failed revolutionary uprisings and counter-revolutionary terror and shone a lurid light on the darkness of the ‘50s on both sides of the Iron Curtain. Beyond the depoliticised general public, the fragmented, colourless remnants of left grouplets often demonstrate their lack of understanding. 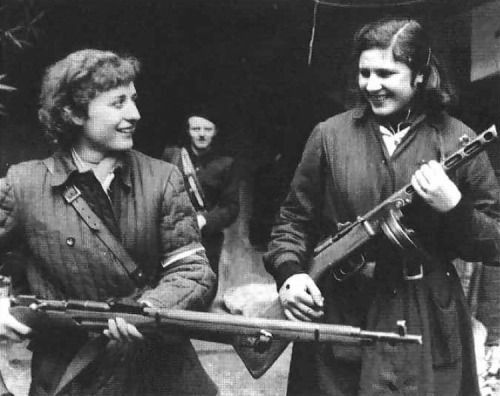 For them, the Hungarian Revolution was a false revolution at the wrong time and in the wrong place. Either because they believed that the state-capitalist countries had positive characteristics in comparison to the Western countries (which were then booming), or because they distorted the everyday details of the Hungarian Revolution. The execution of members of the secret police (in which even old fascists had found a new field of activity) is, for example, still depicted in junge Welt as an “anti-communist massacre” even today. The thing was no doubt brutal. But it was in large part a reaction to secret police troops machine-gunning unarmed demonstrators and murdering so many rebels. If these facts are distorted by supposedly Left journalists, either at the time or now, then it is simply disgusting. Yes, there was mob justice. But, as so often in history, violence and terror was not started by the rebels and revolutionaries. But getting back to the days of October 1956, how did the Hungarian Revolution come about, how can we today, half a century later, imagine its events? In the course of Autumn 1956, there was an increasing student radicalisation, not least as a result of the unrest in Poland with the Poznan uprising and its suppression. Because of the composition of the student body at the time, comprising mainly working students, it cannot be compared to the average student in today’s Western Europe. The sympathies of these students lay with the Polish developments in Poznan. One of the slogans in Poland at that time was “Freedom and Bread”. The uprising in Poznan, like Janus, wore two faces. For many Polish workers, it was a question of improving living conditions and freedom. It was different for the bourgeois forces and reformers in the ruling Stalinist parties, which bet on a development of national independence and thus a broadening of their positions of power. It was the same in Hungary. The student demands, for press freedom, withdrawal of Russian troops, authorisation of a multi-party system, the guaranteeing of liberty and civil rights, the cessation of economic exploitation, and so the end of reparations to the USSR, and the punishment of those responsible for Stalinist terror, relied on the 12-point programme of 1848. Against the background of a government implanted by the Soviet Union in 1944, in part composed of old-style military men and fascists (incarnated in von Dálnok and others), and later one-party rule, which could neither solve economic problems nor express the wage-workers’ desire for freedom, the originally merely democratic demands took on a different character. In 1956, the economic situation had drastically worsened in comparison to 1949. According to an opposition group’s calculations, workers’ living standards were 17% lower than those of 1949, and 55% of the population lived below the minimum for a sustainable existence. The daily wage of a rural worker in a state concern was insufficient to buy a loaf of bread. In roughly 15% of families there was fewer than one blanket per person. 20% of wage-workers did not possess a winter coat. This was the reality for the working class. On 23 October, student bodies organised a sympathy demonstration for the Polish population at the memorial to the Hungarian freedom-fighter Jozef Bem. The Ministry of the Interior first approved the demonstration, withdrew the approval the same day and then lifted its ban again as its political calculations changed. In the early evening, demonstrators gathered in different parts of Budapest. Then the demonstrators moved to the Bem Memorial. At first, the procession consisted overwhelmingly of young people and students, and these were joined by women, school students and small groups of workers. During the march, speakers repeatedly indicated that they were acting in solidarity with the Polish protesters. At the end of the demonstration, the masses did not disperse but streamed into Parliament Square and decided to send a delegation to the broadcasters’ headquarters, in order to get their demands read over the radio. Another group went to the City Park and tore down the Stalin Memorial. In the city centre, all traffic had ceased. In the meantime, the mass of the demonstration marched to the broadcasters’ headquarters, in front of which the Security Police, AVO, had placed a guard armed with machine guns. The AVO let a delegation from the demonstration through. The return of the delegation was so delayed that the demonstrators began to push the police aside. Cries of pain rang out. The AVO had launched a volley of machine-gun fire into the crowd. In hand-to-hand fighting, the rebels overwhelmed and disarmed the police. The news spread like wildfire. The Hungarian Revolution had begun. Workers returning from the munitions factories organised the self-arming of the ever swelling crowd. The police gave up all resistance. Soldiers, too, surrendered their weapons and joined the demonstration. The incredible had happened. Rulers in East and West were stunned that ordinary people spontaneously succeeded in acting against the state. Such self-arming of working people is a horror to all parties from right to left. There was no plundering, no murder, and little mob justice. The uprising was the spontaneous high point of a long development. The rapidity with which the rulers’ power structures, its party, its army and its bureaucratic apparatus crumbled, and its ideology dissolved into pieces, can only be traced back to the reality of the revolutionary uprising. Political: the struggle must be ended, an amnesty announced and negotiations with delegates of the youth opened. A government led by Imre Nagy that also includes representatives of the unions and the youth too must be established. The economic situation of the country must be openly laid before the population. People who have been wounded in the tragic struggles that have just happened must be given help, as must the families of the victims. To uphold order, the police and the army must be strengthened by a National Guard, composed of workers and young people. With the support of the unions, an organisation of young workers must be constructed. The new regime must immediately enter into negotiations over the withdrawal of Russian troops from Hungarian territory. re-equalisation of wages: an immediate increase of 15% for monthly wages under 800 Forint and a raise of 10% for monthly wages under 1500 Forint. The maximum wage should be 3500 Forint. Abolition of production norms except for concerns where the Workers’ Council decides to keep them. Abolition of the 4% tax that the unmarried and childless families have to pay. The lowest pensions to be raised. Family allowance to be increased. Acceleration of state house building. The promise of Imre Nagy (the Minister who was called into office in the government crisis to blunt the thrust of the revolutionary wave) must be kept and negotiations with the USSR and other countries must begin to establish economic relations which rest on the principles of mutual advantage and equal rights. The situation had significantly changed. Day and night gunfire was to be heard. Traffic had ceased. On the streets lay the wrecks of Soviet tanks which had been put out of action, while elsewhere tanks continually went up and down the street to keep an eye on things. Dual power had emerged. Various parties made their presence known. 25 new newspapers appeared. Real power was with the Workers’ Councils. The most remarkable thing was that out of an autonomous demonstration and protests without a real leadership, indeed, without any well-established programme, it was not chaos that emerged but a political structure with living organs, the workers’ councils. Men and women dependent on wages began to attempt to dismantle class rule. But it was also a revolutionary uprising that could not build on an organisation or even a party of workers and those dependent on wages, nor could it bring about such an organisation or its further development. In full clarity, the revolutionary earthquake in Hungary showed that so-called “real socialism” had nothing, not even a trace, to do with a socialist or communist society. This lesson, today, as in the past, has never been understood by all too many self-proclaimed left-wingers and would-be revolutionaries. This is not all: the Hungarian Revolution was essentially contradictory. It was a revolt with confused, self-contradicting demands. Hoping to achieve national independence in the midst of the Cold War was a fatal error, not just of timing, and it was a false hope that Imre Nagy, especially, stood for. The popularity and sympathy that Imre Nagy enjoyed with the population (in the aftermath, too) should not be confused with the autonomous demands of wage-workers in Hungary 1956. Even if hindsight says that the working class was just gradually and hesitatingly becoming aware of its class interests, and that their demands still displayed bourgeois or supposedly bourgeois characteristics, there were two parallel developments. One was that of the ruling Communist Party with both its Stalinist and reformist wings and the middle classes who supported this road, and, the other was the political and social coming into being of the working class, and it would be wrong to put them into the same box. For all their differences, Imre Nagy and Jan Kadar were agreed on one thing. They had the deepest hatred for the social revolt. Imre Nagy’s path torpedoed the Hungarian Revolution with his conciliatory role and a policy course against the Soviet Union full of half-measures: he paid for this shady and miserable course with his life — but so did the workers in revolt. An internationalist consciousness and the idea that international wage-workers’ solidarity, the unity of the international class of workers and a revolution reaching across countries is the sole basis for the self-emancipation of the workers was missing in Hungary, or at least was present only briefly, spontaneously, and in its initial stages. Solidarity with Polish workers and directed work with the aim of speaking to the Soviet soldiers was at best spontaneous. Solidarity between workers in Eastern and Western Europe was almost absent or only rudimentary. Even the best propaganda work under the conditions of the Cold War would probably have produced no results or changed little. In Hungary before 1956, the working class didn’t possess an independent organisation or party conscious of its class, which, in the uprising, could prove itself to be a force and show how to generalise international experience and thus resist bourgeois demands at the time of the uprising and afterwards have something to offer against the rulers. Even from the defeat of the Hungarian Revolution, only conditional conclusions can be drawn. Sources and documents in which workers speak politically on their own class basis are rare. This does not make today’s analysis any easier. In connection with Yugoslavia’s break with the Soviet Union and the former’s attempt at workers’ self-management under the auspices of the Party, false ideas of, and sympathy for, the Yugoslavian model was dominant among those dependent on wage-labour in Hungary. The consciousness that workers’ self-management was just another way for state-regulated capitalism to play the game was missing. If today the bourgeois media loudly proclaim that the deeper meaning of the 1956 Revolution was only apparent in 1989, that is just ideological phrase-mongering. However, it also reflects the anxiety that the working class, whose face shows the troubles of daily life under capitalism, could become aware of its situation and go over to resistance. The comprehensive crisis of Imre Nagy’s government, which still felt a duty to the USSR, but, on the other hand, also attempted to carry out its own national projects, and consequently followed a zigzagging course, led to the Soviet tanks drawing back on 28 October. This was a ruse which massively weakened the Revolution at an especially critical point, and was nothing other than a tactic of war. For the government, this was a helpless and pointless attempt to bring the country back under control, which did happen, but not under them. Restoration! The feigned retreat was only the prelude to the definitive defeat of the revolutionary uprising, whose timing could not have been chosen with more skill. The Suez Crisis, with the military intervention of Britain, France and Israel in Egypt, kept the Western Powers busy. On 2 November, Imre Nagy, after failed threats against, and useless attempts to negotiate with, the USSR, declared Hungary’s neutrality with its exit from the Eastern Military pact. The defeat of the Hungarian revolt was imminent. On 4 November, Budapest was shocked by the thunder of shells which exploded in the centre of the city. The Soviet army units had begun their attack to definitively crush the Hungarian uprising. Primarily in Budapest’s workers’ quarters there was bitter fighting. There was a countrywide general strike. In the end, the Hungarian workers had to give in to the Russian troops’ military superiority and their own reform government. On 15 November the countrywide uprising was finally broken. Now, under Janos Kadar after the military defeat, execution, internment and imprisonment were handed out by merciless Special and Summary Courts. Janos Kadar only lifted martial law on 13 July 1957, which shows, on the one hand, a lasting period of resistance, and, on the other, the Kadar government’s fear and caution with regard to continuing or further unrest. When the Hungarian Revolution had been smashed, the abominable crocodile tears of the West began to be shed. The Hungarian intellectuals of the Petöfi Circle reduced the uprising to a “revolution for human dignity”, or proclaimed it to be a “worldwide symbol of freedom and its tragic defeat”. Just like the nationwide uprising of 17 June 1953 in East Germany, all bourgeois forces spun the revolt against its own aims into an alleged national rising. Hungary 1956 was an attempt at a social revolution: wage-workers in the cities and in the countryside wanted a fundamental change in the relations of production. Both the uprising of 1953 and the Revolution of 1956 in Hungary were revolutionary convulsions, revolutionary uprisings, which were unable to shake off the burden of the ruling class — which deformed the revolts themselves — and liberate themselves. 1953 and 1956 belong in the ranks of the revolts, uprisings and revolutions that all revolutionaries must carry in their memory in mourning for their failure and defeat and to use as indispensable material for their ability to learn. These events must always be kept out of the clutches of forgetfulness. junge Welt (Young World) was founded in 1947 as the youth paper of the East German Communist Party and became the most read paper in East Germany. Since 1994 it has continued its nostalgia for Stalinism (it is edited by a former member of the Stasi). These were the 12 points of the 1848 revolutionaries and initially accepted by the Habsburg Emperor. “What the Hungarian nation wants. Let there be peace, liberty, and concord. Béla Miklós Edler von Dálnok (1890-1948) was a career military man who worked with the authoritarian and anti-Semitic Hungarian government of Admiral Horthy between the ends of WWI and II. In October 1944, he went over to the Red Army and tried, with its help, to get the Hungarian 1st Army to follow him and desert the Axis powers. Presumably, this decision was motivated by the Axis powers' deteriorating military situation, as he had previously shown no sympathies with Stalinism (let alone genuine communism). As a reward, he was given a post in the government the Stalinists imposed on Hungary immediately after World War II. Seniors might remember the insulting nationalistic joke (?) :'The Hungarians behaved like Poles, the Poles behaved like Czechs, and the Czechs, as usual, behaved like swine !' But seriously, what was the extent of imperialist provocations in Hungary and other countries by 1956 ?